Emmanuel Le Roy Ladurie is a professor at the Collège de France and since 1973, chairman of the Department of History of Modern Civilization. He has also been Administrateur Général of the Bibliothèque Nationale de France (1987-94). 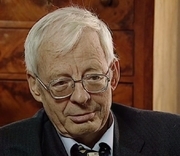 He is a distinguished French historian whose speciality is the Languedoc region of southern France, particularly the history of the peasantry. His most famous work is Montaillou, village occitan de 1294 à 1324 (1975), a multi-layered study of the life of the village of Montaillou during the age of the Cathar heresy. Prof. Le Roy Ladurie often writes for publications such as Le Nouvel Observateur, L'Express, and Le Monde, and appears on French television. Emmanuel Le Roy Ladurie is currently considered a "single author." If one or more works are by a distinct, homonymous authors, go ahead and split the author. Emmanuel Le Roy Ladurie is composed of 19 names. You can examine and separate out names.